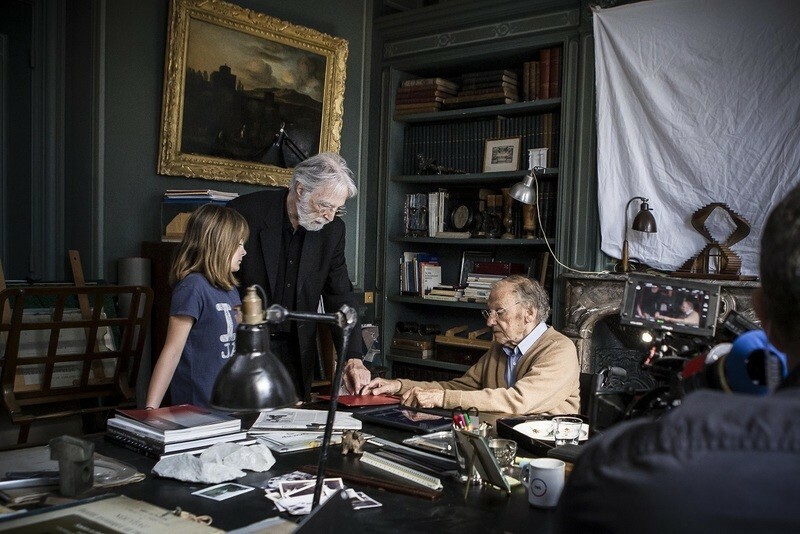 Michael Haneke’s latest drama “Happy End” begins with cell phone footage shot by teenager Eve Laurent (Fantine Harduin) of her mother. Later, Eve shows her mother unconscious and she admits that she poisoned her. 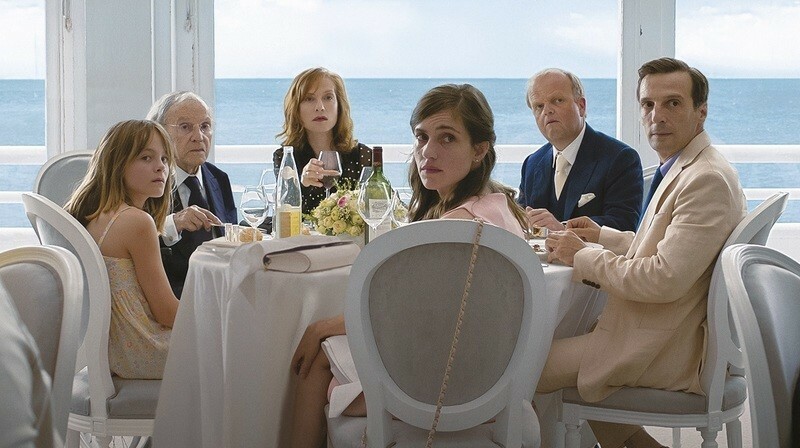 Haneke then expands the scope of the film to encompass the entire Laurent film—Anne (Isabelle Huppert), who owns a construction firm broiled in an accident at a site; her father Georges (Jean-Louis Trintignant), who suffers from dementia; and her brother Thomas (Mathieu Kassovitz), Eve’s father, who’s having a sadomasochistic affair with a musician. The film explores the connection between the moral rot within the Laurent family and the ongoing European migrant crisis, and how ignorance and apathy extend from the personal to political realm. 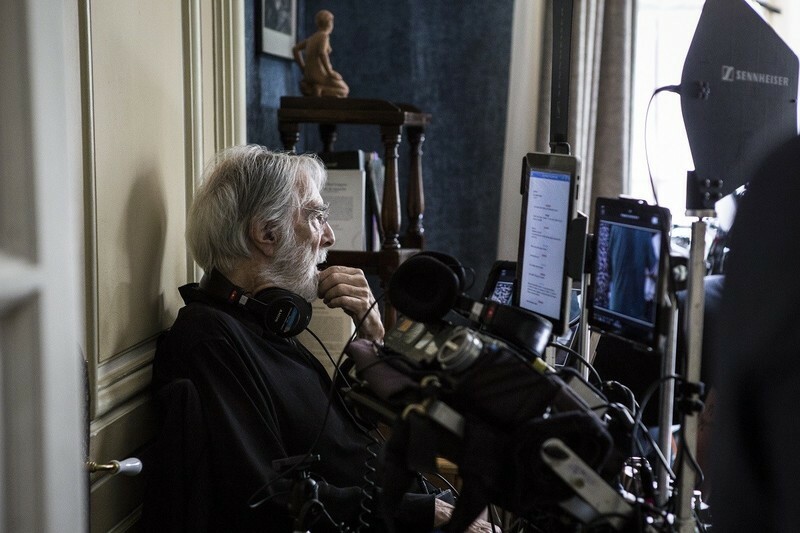 After its North America premiere at the Toronto International Film Festival, Haneke spoke with RogerEbert.com (through a translator) about social media, the current political climate, and what not to take away from his films. The use of social media in the film is quite interesting insofar as it opens and closes doors to intimacy between the characters. How much research you did into things like Facebook Live, vloggers, and such? Do you find them to be effective communicative tools? There are the existing tools of communication. Whether I find them good or bad, they exist, and I try to show them without judgment. It’s impossible to make a film about contemporary society without showing them because we’re all confronted with them constantly in our daily lives. In the film, there’s a way in which people are more honest using these tools but they don’t necessarily bridge the gap in real life. Is that your perspective on it? It’s not my impression that people are more open or less open, more honest or less honest in digital communication as opposed to real communication. Hypocrisy exists everywhere. When first formulating “Happy End,” I’m curious if you started with the family or started with the political climate, or were they both intertwined in the creation of the script or during shooting? It was really all together, those different elements. The starting point for the film was a story I read about in the newspaper, a true story that took place in Japan, where a 14-year-old girl, as in the film, tried to kill her mother while publishing on the Internet. That was the starting point, and then I wanted to develop a family around that that would allow me to present different people, different aspects of their lives. This is the first time you’ve directed a young actor since “The White Ribbon.” I’m just curious if you have a different approach for directing a young actor verses someone like Isabelle Huppert or your established players. Do you adopt a gentler approach or do you treat them all the same? I work with them more or less the same. There are some things that are more difficult for children because of their lack of experience, you have to rehearse with them, prepare them, but I work with them pretty much the same as adult actors. You said at Cannes that you hope the audience doesn’t take away a principled theme from the film, and I found that very interesting. What else don’t you want the audience to take away from “Happy End”? It’s the case that I don’t want to tell people what they should take away from the film. It’s my experience that a film doesn’t end on the screen but in the minds of the viewers, and, in fact, it’s my experience as well that there are as many different films as there are viewers of the film. Each person sees the film differently. You see that, for example, in reviews. Different reviewers see the same film and talk about it in such different ways. I think that’s very important. I don’t want to restrict the spectator’s reaction to the film by telling them what I think is important, by giving a guide to my interpretation of it. I want them to come up with their own answers. So, you don’t consciously craft a message into your film? Many critics charge your films with a certain brand of misanthropy. Do you view this charge as accurate or do you find it to be reductive? I see myself not as a misanthrope but as a philanthrope. I think that if I were a misanthrope that I would be making escapist mainstream movies that assume people are so dumb that they’re not able to talk about serious matters. In “Happy End,” and in many of your films, there’s a running theme of grief, or coming to terms with death. Given the inevitability of death, do you view it as a relief from life or just simply as an extension of life itself? [Pause] I really don’t want to answer that. I always say there are two things I don’t like to talk about: my sexual and my religious proclivities. Fair enough! I wanted to talk a little bit about the wedding scene. I’m curious as to how that scene was crafted on the page versus how it was shot. Was there any sort of difference between what you formulated beforehand and what if anything the setting brought to the scene? It’s a very fraught, interesting scene, but I wasn’t sure how much was planned and how much was discovered on set. The film was shot in a studio and shot exactly as I wrote and storyboarded it. Do you extensively storyboard all of your films? Given the migrant crisis’ relevancy in the political climate today, both in Europe as well as the way it’s become politicized in America, how do you feel the characters in the film engage or disengage with the crisis, and what are you trying to convey with their indifference? I think the film is relatively typical of our refusal to engage with the world. We don’t want to engage with the world. We refuse to see it. The reaction of the family towards that crisis is pretty prototypical of the behavior of everyone in the so-called “first world.” We’re much more preoccupied with our own little aches and pains and refuse to see the real problems that are confronting humanity. I think that’s my experience. I think it’s generally the case of how people react. We prefer ignorance. We live in a society of ignorance and willful autism. We prefer to occupy ourselves with our own petty existences. That’s why the film is a farce. The real tragedies take place in the third world. Do you still go to see films? What do you like in contemporary cinema? I don’t see very many films at all. But in general, I have to say, the films that have inspired me recently are films that comes from the so-called “third world,” that show me things that are not present in our western world. I’m thinking of filmmakers like [Asghar] Farhadi from Iran, he presents films that I don’t find anywhere else. But there are any number of younger filmmakers whose work impresses me. I just don’t like to mention any of them because inevitably I forget some and they feel insulted or offended. The reason why I ask is because you mentioned “Happy End” was inspired by a story you read. I’m curious if you take most of your inspiration from the real world or from other films. When I began to make films, or when I began to think I wanted to make films, then I saw any number of the films. I’d go to the movies three times a day and I was very influenced or impressed by the great filmmakers such as Bresson and Tarkovsky. Today, I teach film directing at the university in Vienna and so through the course I watch any number of great classics with my students and derive a great deal of pleasure and instruction from that. But in terms of the yearly current newer films, then I don’t have time to see very many of them. Do the skills you have as a director help you in the way you teach classes or engage with students? Well, first of all, I see my task as trying to pass on or transmit my technical experiences, the craft I have developed over the course of making films, and this is what I try to give my students. Mark Twain had a very good sentence. He said, “Those who can, do. Those who can’t, teach.” [Laughs] I see that at the university. A number of other teachers don’t really have any understanding of the craft whatsoever, but try to teach nonetheless. I think the hardest part as a young person, as a student is to try to find your own language, and if I see a student trying to make a Haneke film, for example, I’m the first to tell them to stop and to try to develop something more personal. Next Article: Living Out Her Dream: Brett Morgen & Jane Goodall on "Jane" Previous Article: A New Frontier: Bill Pullman and Jared Moshe on "The Ballad of Lefty Brown"